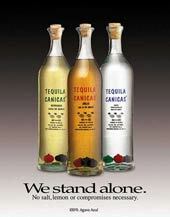 The most well kept secret among super premium tequilas is primed to become the most coveted bottle to locate. Why, you ask? Because Tequila Canicas is crafted drop by drop from 100% Blue Agave plants that are allowed to mature eight years before harvest. It’s triple distilled and shipped in hand-blown bottles from the volcanic hills of Jalisco, Mexico. It truly has everything the true connoseur desires including two gold medals from Tastings, the Journal of the Beverage Testing Institute. Tequila Canicas. So exclusive it’s even hard for us to get our hands on. Information from client's website.